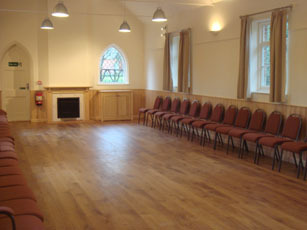 Alongside All Saints Church, the Church Room has been completely refurbished to a very high standard and was officially opened by the Bishop of Winchester on All Saints Day 2009. 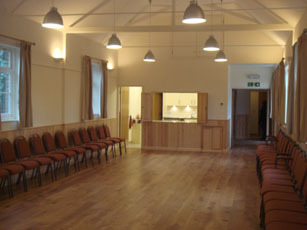 The cost of the refurbishment was met, almost entirely, by the generosity of the villagers and those who have an affinity with Braishfield. We were very fortunate to receive grants from The Low Carbon Building Programme and the Community Sustainable Energy Programme, towards the cost of our heating system. There is a new oak framed entrance easily accessed, with a wide doorway and parking in the Church and church room car parks. 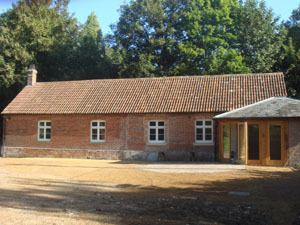 Very attractively fitted, the building is heated using a ground-source heat pump, taking heat from under the bottom car park; the heat pump mechanism is housed in what used to be the mower store. 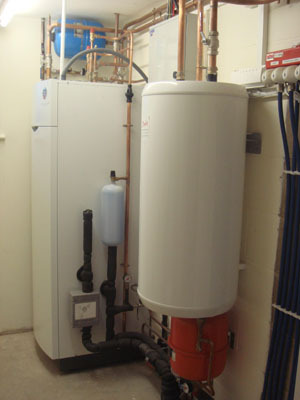 The water temperature is raised in the heat exchanger and is used in both our under floor heating throughout the building and our running hot water in the kitchen and toilets. The main room has a welcoming log fire, comfortable chairs and good lighting to suit various needs. Sixty people can very comfortably sit at long tables for a meal, more can be sat round tables with less comfort. Smaller groups have the space for sitting at table as well as a relaxing area round the fire. The excellent kitchen has a large cooker with extractor hood, a commercial dishwasher, a plate warmer and a refrigerator. 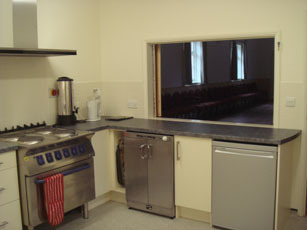 Two hatches are available to help the unloading of food from outside as well as for serving into the main room. There are over 60 cups and saucers and dinner and pudding plates, as well as place settings of cutlery. The toilet area has coat hooks, two toilets, both for male and female, one of which is an easy access toilet. 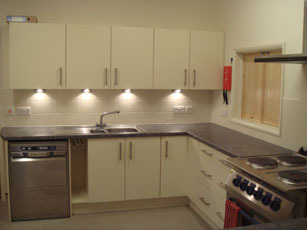 The charges are £10.00 per hour for occasional use and £7.50 per hour for regular users. This includes the use of the kitchen, the cost of heating and electricity. You will need to fill in a booking form. Please use the online booking form. Fill in your contact details, the details of the requested hire and then press the 'send' button.